People everywhere enjoy the pleasure of growing plants. Most people use their backyards for this purpose, growing ornamental as well as plants used for eating. However, many people around the world don't have a backyard because of space limitations, something which is becoming more common everyday with the growth of world population. 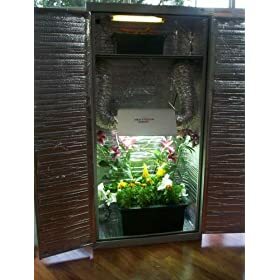 For people who want to grow beautiful flowers, healthy vegetables, herbs and spices in reduced spaces, hydroponic gardening becomes an evermore interesting option. Hydroponic gardening, which does not use any soil, is ideal for growing many plants. This type of culture has the advantage of not needing any soil and of letting the grower choose the precise composition of the nutrients received by the garden. When this is coupled with a tight space, hydroponic gardening opens up the possibility to grow plants in much higher densities and in much better quality and uniformity than soil based plants. With living spaces being more populated everyday and commercial soil based vegetables becoming more polluted and damaged, it is evident that the use of currently unused city spaces (such as rooftops) will become very important for the food provisions of the future. Small hydroponic systems for people with drastic space limitations can be easy to install. From the inside of a closet to a small patio or a window edge, soiless gardening offers the solution to the problem. This systems known as hydroponic grow closets are becoming more and more popular everyday (I will publish a tutorial for building a hydroponic closet soon).